We went “home” for Christmas. Just like the song says. We debated this plan because Andrew has wrestling practice over the winter break, but decided to go because I’d not seen my brother in a year and because Andrew wanted to. Dona, slightly marinated in red wine. We drove into Illinois on December 23, just as an ice storm was developing. We had a nice visit with my brother over pizza and beer. We awoke the next day to ice-sheathed trees, ice-covered walkways and ice-encrusted snow drifts. We normally spend Christmas eve with Dean’s family and this year was going to be unique because it was going to be held at Danny and Carol’s new home. However, not only were trees, walkways and snow covered in ice — so were power lines. The electricity to the new house was out and the celebration there was postponed. Mom, relaxing. Happy to not cook. So, instead of having a ham dinner at Carol’s we ate mediocre Greek food at Paul’s. At least the wait staff was friendly. Since we stayed with my brother, Kevin, I thought that having dinner (cooked by Kevin and me) at his house would be the best plan. I didn’t plan on the ice storm. 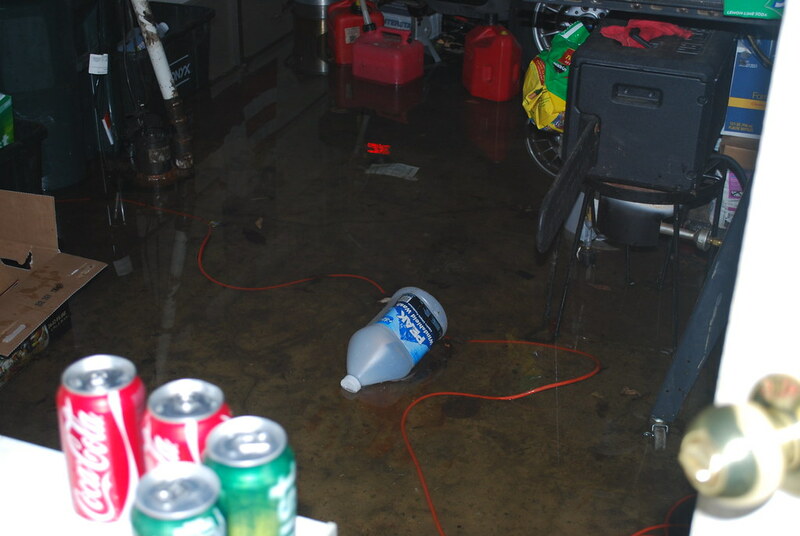 Or the flooded garage. Or the frozen turkey. And I’m a little confused (but not in a bad way) how we ended up celebrating Christmas with Kevin’s (first) ex-wife and her ex-boyfriend. My mom doesn’t like to drive in bad weather, so the drive down and back was a little nerve wracking for her. Everything worked out well, though. Jill (Kevin’s ex-wife) is a brilliant and resourceful cook. Too much meat (turkey breast, ham & rib roast) to cook in the one oven? No problem — pull out the grill. Result = delicious smokey flavored chicken breast and moist ham in addition to perfectly cooked stuffed rib-roast. Jill’s ex-boyfriend, Devin, was the life of the party, alternately serving as DJ and practical joker (Kevin is still finding beer-bottle caps around his house). Mom and Dad had a safe journey home and we spent the rest of the night building gingerbread houses, watching movies and finishing off the wine. Sometimes traditions are what is needed, but occasionally spontaneous moments are just as rewarding. You look good marinated in red wine! And I love all those complicated “exes” and “formers,” all getting along so well. I’m waiting for the next installment–Christmas delayed at the new homestead. Thanks Deloney & Helen (I think). Lali — it was a lot of fun — I like Jill and enjoyed meeting Devin. I forgot to mention The Incident of the Dog in the Daytime. All over the dining room carpet. Luckily Kevin had a steam cleaner.